Ever ready for providing protection, wearing armour, wielding the sword, bow and arrows, those two vibrant youth always walk with me. O Raama and Lakshmana, protect me! I bow down to the bow-wielding Raama, armed with incisive arrows, the subduer of all asuras, he who wards off all my difficulties. I bow down to him whom I know as Raama, Raamabhadra, Raamachandra, Raghunaatha, Naatha (my overlord) and husband of Seetha. 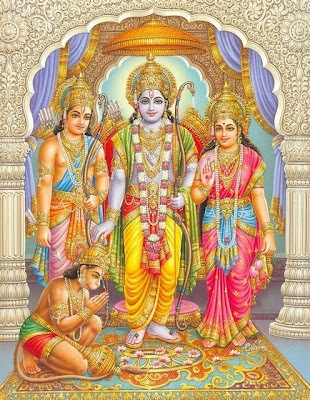 Those two warriors of supreme strength, Raama and Lakshmana stand with me, before and behind, always close by, armed to the ears with weapons like bow etc, they always protect me.